Gili Selang is a small island lying off Bali's most eastern point and like most of the dive sites in this area it has intensely strong currents. There is an interesting coral and sand slope to the north of the island that has large leather and brain corals along with a few barrel sponges. The current will sweep you along the outer wall which drops off into a deep channel and you will end up at the south of the island where you can escape the torrent. 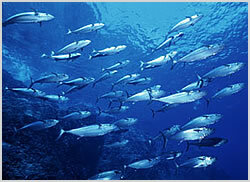 Jacks, tuna and barracuda frequent the area so look out for them along with occasional the shark or two. Around 500 meters south of Gili Selang are three rocky outcrops carpeted in coral. Current permitting you can dive around the formations looking out for macro life. Waterloo is a newer spot even further south with good coral and marine life. Getting there : Boat from Amed, 30 minutes.